Highlighting our sponsors, donors, volunteers, community members and fundraisers. At a time of year when Canadians are still wearing their winter jackets, snow tires are still secured on their cars and the ground is just beginning to thaw – the last thing you think hockey players would be thinking about is summer camp. But that’s exactly what this month’s Kids Cancer Care champions were thinking about in March, April May and all year long. In 2011, Dan Finot was eager to do something to honour his mother, who was recently taken by cancer, while bringing people together, united in a common cause. Dan came up with a charity hockey tournament and brought a couple of friends in on the idea. His friends Greg Gerritsen and Patrick Sutherland had also lost family members to the disease and together they built the Cross Check Hockey Tournament. The guys were quick to point out that from the beginning their spouses Jen Finot, Janice Gerritsen and Ashley Sutherland have played a big role in the charity fundraiser. The idea was simple: local teams sign up, raise funds to support people affected by cancer and get together for a weekend of good ol’ hockey. The guys encouraged hockey players any ability to register. It was about the game, but it was mostly about the cause. That first year they raised $27,000 for the Canadian Cancer Society. From there, the tournament grew. In 2013, the tournament was moved to Winsport’s arenas, which could house significantly more teams. That year they raised $50,000 and the next they raised almost $100,000. In the coming years, the tournament would hit rough times. Team participation dropped and so did fundraising dollars. But, Greg, Patrick and Dan refused to give up. In 2017, they partnered with the Big Hearted Mavericks, a group of local Calgarian businessmen dedicated to charity. The Big Hearted Mavericks had supported Kids Cancer Care and suggested the guys check out Kids Cancer Care’s Camp Kindle. So, Patrick, Greg and Dan took a trip out to the camp in Water Valley. They were blown away. Kids who have been diagnosed with cancer, and their siblings, get to escape the demands of cancer for outdoor fun and adventure in a safe, caring environment. Hit the ice and think of summer camp. That year, $50,000 was raised, sending over 33 kids to camp that summer. Patrick, Greg and Dan have found ways to remind the players just why they are there. Colette Benko, Kids Cancer Care’s 2017 spokeskid spoke at the tournament’s Opening Ceremonies and inspired every player and spectator alike. The group has also created special trophies to honour those who have lost their battles with cancer. Patrick shares, “In 2017, we introduced a magnificent trophy ‘The Kristeena Shultz Memorial Cup’ which is awarded to the top fundraising team. Kristeena Schultz was a beautiful and wonderful team leader who brought the first Women’s team into the tournament. Kristeena lost her battle to cancer but has inspired many of us on her courage and determination.” There is also a Legacy Cross Check Cancer Cup, which has Dan’s mother’s name engraved on it. And this past year’s tournament in May 2018, was even better. Over five-hundred players hit the ice with summer camp and those affected by cancer on their mind. This year, they raised over $60,000. And, forty more kids got to go to summer camp. It was also the second year the organizers put in their own team, The Terminators. Cross Check Cancer also hosts a Golf Classic Tournament. Next year will be the 5th year of the tournament and it will occur in September. Sitting in a coffee shop in Calgary’s inner city on a chilly February afternoon, Brent Thorkelson describes one of his most memorable days. In the sunny Okanagan on a gorgeous May long weekend, Brent is behind the wheel of his 2007 GT3 Porsche. A Porsche lover since he was five-years-old, Brent knows this car well. His passenger is a young man named Connor. Earlier that day, Brent had met the shy preteen. Brent says, “Connor seemed so sad, he was quiet, almost depressed” as he climbed into his race suit, put on his helmet and was strapped into the five-point harness. And he had every reason to be. This weekend was a rare break from his childhood cancer treatments. Brent and Connor are driving up Knox Mountain as part of the Knox Mountain Climb, an annual event in Kelowna. Trees blur past them and the road winds. In just two minutes they have travelled 5km and climbed 800 feet. They’ve hit most of the ten turns on the route. The speed of the car picks up and they enter what racers call the 100-mile-an-hour club. It is at that moment that Connor’s whole face lights up. Brent can’t help but smile. It’s not the first or the last time he will venture up Knox Mountain. In fact, he does it every year. Hands Together for a Cure is a passion project for Brent, his wife Lenora and their son Ben. Brent has always been involved in motorsport and wanted to use his passion to give back. As an Advanced Care Paramedic for over 28 years, Brent finds himself on the scene of countless “accidents.” But he doesn’t love the word: “The term accident infers that nothing contributed to the event. More importantly, that the event was not preventable. As a practitioner, we see numerous incidents, but very few accidents. You can’t get a truer definition of this word than a child being afflicted with cancer. He or she did nothing what so ever to be “saddled” with this unforgiving disease.” The Thorkelsons wanted to do something to bring joy and laughter into these children’s lives. That’s where the Knox Mountain Hill Climb comes in. Brent has been going to the Knox Mountain Climb since he was five. The event includes a beer garden, car show and the competitive climb. His dad, now 88, still joins him every year. He knew that something that brought him so much joy could also bring some happiness to these kids, if even just for a day between treatments. 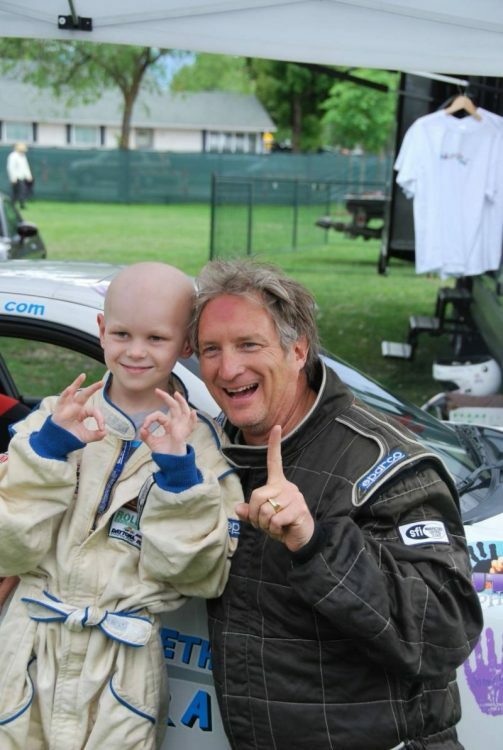 Brent and his Porsche do about 12 to 13 drives up the hill through Hands Together for a Cure each year. The ride is unique in that it gives children an experience they wouldn’t otherwise get and at the same time it is a fundraiser. The kids ride for free, thanks to year-round fundraising through Hands Together for a Cure and donations from other drivers in the Knox Mountain Hill Climb. Brent sells the remaining spots at $500, with all the proceeds going to childhood cancer research, including Kids Cancer Care. Humbly, Brent shares what goes into making the event a success: a website to maintain, pounding the pavement to sell rider spots, coordinating the kid spots with charities in British Columbia and Alberta, organizing transportation for the families (thanks to CanWest Air Charters), silent auctions, appearances, picking up cheques from donors. 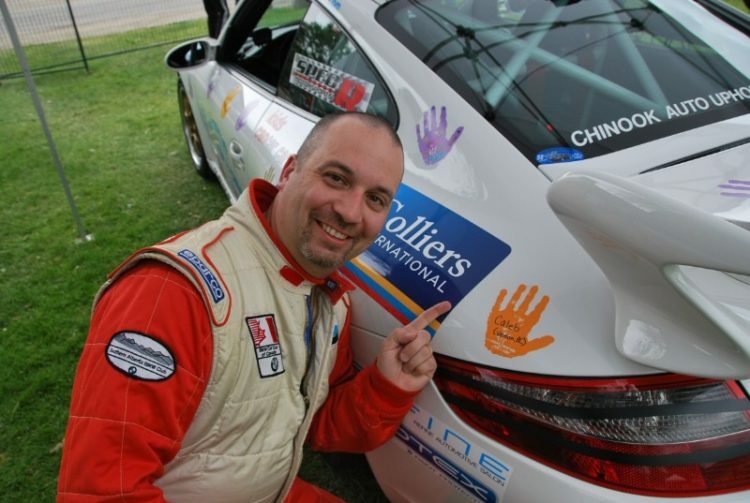 That doesn’t even touch upon the upkeep of the car, which is covered in handprints of children who have had cancer – a constant reminder for Brent and those involved as to why they do this every year. Last year, Hands Together for a Cure broke $115,000 total raised in 6 years. Connor and Brent are at the top of the course and start heading back down the hill. The other drivers unbuckle (no easy task) and get out of the cars. Marshalls line the route and give a standing ovation. And on the way down, all Connor could say was, “Wow!” Brent can still hear the words clearly in his mind, like it was yesterday. All the funds raised from Hands Together for a Cure are making a difference in the lives of children affected by cancer. The funds donated to Kids Cancer Care research to change the course of childhood cancer for the approximately 1,400 children diagnosed in Canada every year. Brent smiles as he shares that Connor is cancer-free today, something he hopes for every child fighting cancer. And that is no accident. To book your ride with Hands Together for a Cure at The 2018 Knox Mountain Climb, click here. When CANA partnered with Kids Cancer Care to celebrate its 75th anniversary year, they knew their employees would jump in to raise funds and meet their $75,000 fundraising goal. What they didn’t know was that even the children of CANA would get involved. CANA launched its 75 for 75 fundraising campaign in December 2016 and within months the kids of CANA employees were already rolling up their sleeves to help. They sold firewood, held bake sales and bottle drives. Six-year-old Clayton McLeod even turned his birthday into a fundraising moment, encouraging friends and family to donate to Kids Cancer Care in lieu of birthday gifts through our Give More Birthday program. Clayton raised over $900 for Kids Cancer Care. After a full year of fundraising, CANA employees raised $101,704, far surpassing their $75,000 target. CANA employees held bake sales and yard sales, shaved their heads, ran in the Calgary Marathon and sponsored a table at the Dad and Daughter Gala. Their president Fabrizio Carinelli took part in Kids Cancer Care’s High Hopes Challenge and finished as the top fundraiser. But that’s not all. CANA employees and sub-contractors also gave their time, carrying out renovations at Camp Kindle at no cost to the foundation. There’s no doubt, that CANA is creating a culture of giving right from the top. When the company launched the fundraising campaign, John Simpson, Chairman of the Board, Owner and CEO of CANA, promised to match his employees’ fundraising efforts dollar for dollar. With Mr. Simpson’s generous matching gift, their total contribution to Kids Cancer Care this year is $203,408. More photos from CANA's fundraising and Anniversary BBQ at Camp Kindle can be viewed on our blog. You can feel it the moment you walk in – a bright, elfin energy dancing in the Jaskela household. Three young children, brimming with questions and stories and explanations on life. “My name is Nevaeh,” the oldest one announces. And she spells it out loud: “N-E-V-A-E-H. Nevaeh is heaven spelled backwards.” Then she explains that she has a brother in heaven and that is why she is named Nevaeh. Although Nevaeh (7) and her younger brothers Weston (5) and Joel (3) have never met their big brother, they know him. His memory is still very much alive in their home. Cohyn was just a year old, when he was diagnosed with a rare and aggressive brain tumour called atypical teratoid rhabdoid tumour (AT/RT). That summer in 2007, Cohyn and his parents embarked on the most difficult journey of their lives. The cancer had spread throughout his entire brain and spinal cord. Cohyn underwent emergency brain surgery, followed by five rounds of chemotherapy and three stem cell transplants. Five months later, Cohyn and his parents were finally able to come home just in time for Christmas. Cohyn was a strong, happy-go-lucky little guy, who loved sports and camping. When he wasn’t at the hospital, his life was all about fast vehicles – motorbikes, boats, golf carts, tricycles. Cohyn also loved to travel with Mom and Dad. Arizona, Mexico, Fairmont Hot Springs, Vancouver, Niagara Falls, Medicine Hat, Sylvan Lake – he travelled more in two years than some do in a lifetime. But Cohyn’s biggest love was hockey. He even played it in the hallways of the hospital. Trisha and Jason fondly remember the outpouring of love and support they received during Cohyn’s cancer journey. And, for this, they are grateful. Kids Cancer Care was one of the organizations that helped Trisha and Jason through this challenging time. Every Wednesday evening, the Jaskelas found comfort in our weekly Pizza Nights at the hospital. During Pizza Nights, they were able to meet other parents facing childhood cancer, exchange stories and share information over warm pizza. “Until you experience it yourself, you can’t understand what a big difference generosity and support can make in a family’s life,” says Dad Jason. Inspired by their son’s memory, the Jaskelas are helping families facing this disease. Jason and his daughter Nevaeh are regulars at the Dad and Daughter Gala and, in 2016, the family made a significant gift of shares through Raging River Explorations Inc., where Jason works as chief operating officer. But the gift of shares in 2016 wasn’t the first gift the Jaskelas made to pediatric cancer. Their first gift actually came nine years ago. Moments after Cohyn passed away in 2008, Jason and Trisha donated his tumour and spinal fluid to research. Slowly, with some scientific arm-twisting, the tumour cells became a cell line and managed to survive in a Petri dish, allowing scientists a glimpse into its inner workings. The cell line ultimately gave researchers an invaluable tool to test for new treatments. Although Cohyn’s life was brief, his legacy is far-reaching and enduring. It lives in the love and generosity of his family. It survives in the tissue and blood samples his parents donated to science a decade ago. And now, his memory lives on in a quaint little park named Cohyn’s Corner, overlooking Kindle Pond at Camp Kindle. And, perhaps most importantly, Cohyn’s legacy lives in the hope his family continues to offer countless families facing childhood cancer today. Read more about Cohyn’s cancer journey here, as part of our #familyseries for Childhood Cancer Awareness Month. Taylor was diagnosed with leukemia the year she was supposed to start grade one. She spent two and a half grueling years on treatment. Her story is one of many shared on special dedication boards at registration for Tour for Kids Alberta, a three-day cycling adventure through the Canadian Rockies, where participants fundraise to ride, with all proceeds to Kids Cancer Care. These special boards each share a different story of a childhood cancer warrior, fondly known by Tour for Kids as ambassadors. Grant was 15 when he was diagnosed with acute lymphoblastic leukemia. Three weeks later he was in remission. However, the cancer would change to acute myeloid leukemia and, later that year, he was diagnosed with skin leukemia. He passed away six months after his first diagnosis. Liam. Stephen. Briony. Alexander. Dominic. These are the childhood cancer warriors that are top of mind for the cyclists on the epic cycling tour through the Canadian Rockies. Each day of riding, a special dedication to one of these children affected by cancer. It’s always been about the kids for Jeff Rushton, Founder, Chair and Very Passionate Volunteer at the Coast to Coast Against Cancer Foundation. Fourteen years ago, Jeff and some friends started Coast to Coast, the Ontario-based organization behind Tour for Kids. “When we started this foundation, we really wanted one thing: we wanted to make a meaningful difference in the lives of kids and their families going through childhood cancer,” Jeff says. And that’s exactly what they have done in the 11 years since Jeff and his team first brought Tour for Kids to Alberta. In total, Tour for Kids has raised $2.5 million dollars for Kids Cancer Care. Through various fundraising events and programs, including the Sears National Ride, Inside Ride, and of course, Tour for Kids, they have raised over $35 million dollars for 50 childhood cancer charities and hospitals across Canada. Their model is low cost. Hard costs are covered by corporate sponsors. That means Coast to Coast has always given 100 per cent of donations raised to the charities they support. But what makes the event stand out is the people. Jeff himself is there at the crack of dawn to greet the riders on the first day and then he joins them on the ride, for every single kilometre. At the end of the weekend, Jeff is there to hand out medals and pat each rider on the back. After the ride starts, volunteers start to pack up the dedication boards at registration. “I need to get a picture of Grant’s dedication board before they load up,” says Mel, the volunteer co-lead, working with Kelly to oversee the 84 volunteers who work the event. Mel, her daughter Ali and husband Jim have volunteered on the ride for six years. She is also Grant’s mom. She’s not alone. Liam’s mom has been a rider two years in a row. Stephen’s dad rides too. Briony’s mom normally rides, but volunteered this year due to an injury. Briony’s sister is the volunteer massage therapist who organizes all the massage therapists and RMTs for the weekend. Alexander’s mom and dad are part of the volunteer crew. And Dominic’s aunt rides every year. On the second night of the ride, participants stay at Kids Cancer Care’s Camp Kindle where all the kids go each summer thanks to Tour for Kids. First, the counsellors speak of their own experiences as a childhood cancer survivor and sibling. Then, the Inkpen family, a family whose son Foster is currently undergoing treatment, speaks at dinner, reminding everyone in the room where their fundraising dollars go. And in that crowd is Taylor. Now 28 and a registered nurse, she rides every year with her dad, Dean Wheatley. Thank you Coast to Coast Against Cancer Foundation, Jeff, Taylor, Mel, and all the volunteers, sponsors and cyclists who make this event possible. By doing so, you make an invaluable impact in the lives of children affected by cancer and their families. Check out this story and more Tour for Kids photos on our blog. Like many great western legends, it began with a wager at a local watering hole. A leather-clad biker named Dirtdog bet a good ol’ cowboy that he could raise more money for charity by bartending than he could. The cowboy took the bet and the challenge was on. That first weekend the cowboy and his friends tended bar and the following weekend, the biker and his crew took over. As with all legendary tales, someone won by a landslide. Dirtdog and his crew walked out of that bar and off into the sunset the victors. The challenge was all in good fun. The money raised was to be donated to charity. Dirtdog, also known at Matthew Janzen, caught the fundraising bug. The challenge inspired him to begin a local motorcycle rally, with proceeds going to charity. And with that, the Strathmore Poker Run was born. In its first couple years, the event was small, but mighty with funds raised going to a local children’s charity. Riders set off from Strathmore and hit five stops in southern Alberta. At each stop, riders pull a card out of a shuffled deck of cards. By the last stop, and many hours later, the motorcyclists will have a complete poker hand. The best and worst hand receive various prizes and plaques. It was a labour of love by Matt and twelve other committee members. Matt led with his charismatic, friendly, brazen, hardworking attitude. What started as a challenge between two very different groups of locals – bikers versus cowboys, –became an annual event that brought the community together. People of all backgrounds, lifestyles, and experiences came together to ride or participate in the weekend’s events. And a stereotype was beginning to soften. Bikers, often judged as a bad group of tough guys, were out on the road doing good, raising money for a good cause. A couple years into the annual event, Matt was diagnosed with cancer. It was a tough blow to the friendly, outgoing biker, who had dedicated the last few years to the big fundraiser. While undergoing treatment, Matt became inspired by the children who fought the disease. Going through his own battle as an adult, Matt was heartbroken to learn that children, so young and vulnerable, were faced with the rigours of cancer treatments. He spoke with his fellow committee members. In its third year, the Strathmore Poker Run chose the Kids Cancer Care Foundation of Alberta to be the beneficiary of their event, in honour of the children undergoing cancer treatment who had inspired Matt. Sadly, Matt lost his battle with cancer in 2002. The legacy left by Matt grew from there. Today, the Strathmore Poker Run is a three-day celebration. On Friday night, there is a Shave You Lid for a Kid® head shave. In 2011, Matt’s mom shaved her head in honour of her son’s memory. Saturday features the poker run, the longest poker run, in kilometres, in southern Alberta. Stops include Rockyford, Carbon, Wayne and Standard, all of which open their community and their hearts to the riders. In the evening, the riders return to Strathmore for their last stop and a dinner and dance. A local band plays, while bikers and their supporters dance the night away. On the Sunday, the focus turns to families, with a motorcycle rally and other activities for everyone to enjoy. The event is run solely by volunteers and local sponsors. Without these generous members of the community, t-shirts wouldn’t be printed, silent auction items wouldn’t be sourced and won and dinner wouldn’t be served (to over 160 people!). And they know, Matt would be proud of what they have achieved in his memory. Over the past 17 years, they have raised $219,496.69 for Kids Cancer Care. The funds raised support families through the entire continuum of childhood cancer — fighting the disease on all fronts by igniting joy and laughter at camp; funding innovative science in the lab and providing the best care and treatments at the hospital; and creating brighter futures for survivors through education support and post-secondary scholarships. And it’s still a labour of love for the 13 committee members. They have been known to be out mowing grass and setting up tents on Friday, rolling up their sleeves to serve dinner on Saturday and cleaning up when the event is over on Sunday. They do it because they know it’s what Matt would have done. Some of them are even permanently inked themselves with Strathmore Poker Run tattoos. Sandy Scobie, one of the organizers of the events says, “It’s great to look back at where we’ve been and the impact we have made. It’s lots of work but it’s worth it. We think Dirtdog would agree. The 18th Annual Strathmore Poker Run takes place June 23 to 25th, 2017. For more information click here. Founded in 1994 from Christine McIver’s basement, the small but mighty organization that cared for families affected by childhood cancer was finally ready for it's big move. The year was 1998 and Kids Cancer Care was relocating to a real office. Like a young adult, moving from Mom’s basement to your first real home, you suddenly find yourself with a new amount of space. And you need furniture. And lots of it. Christine knew exactly what to do. She reached out to friends and local radio hosts Don, Joanne and the Coach. Their morning show was the most heard on Calgary’s airwaves. They put out the call. And their supporters and clients furnished the entire Kids Cancer Care office. One of Kids Cancer Care’s first signature events was the Golf a Kid to Camp tournament. Don, Joanne and the Coach came on board a couple years into the tournament and asked how they could help. Their station and the radio hosts helped take the tournament to the successful event is it today. The Don, Joanne and the Coach Golf a Kid to Camp tournament has raised over $3 million in its 23 years and has sent thousands of children with cancer to camp. This is an unspeakable joy for children with cancer and a precious gift for which they will long be grateful. After being involved with the tournament for a few years, Joanne took a week of her vacation and volunteered as a one-to-one for a camper who needed additional support. “She came back from camp and said, ‘When I retire, I want to work at Camp Kindle,” Christine remembers fondly. In 2003, the trio shaved their heads to show solidarity and support for children affected by cancer through Kids Cancer Care’s largest fundraising initiative, Shave Your Lid for a Kid®. By shaving their heads, they provided much needed moral support for the kids who lose their hair during cancer treatments in a public forum. Nine years ago, Don Stevens took on an even bigger role at Kids Cancer Care. As a dedicated supporter and a huge part of the tournament sponsorship committee, Don joined the Kids Cancer Care Board of Directors. Since then, his expertise and experience in media has put the spotlight on childhood cancer and given the organization so much awareness in Southern Alberta. Over the years, the radio hosts and Kids Cancer Care have shared in many milestones. Don, Joanne and the Coach even emceed Christine’s 50th birthday celebrations. We were there when the Coach departed Calgary in 2009 when his wife’s work took the couple to California. The tournament would go on that year as “The Don and Joanne Golf a Kid to Camp,” but the Coach was definitely missed. The Coach doesn’t golf in the tournament. Instead rides around with Kids Cancer Care’s spokeskid, socializing with volunteers and golfers. Coming up this year, we will celebrate another milestone with Don, Joanne and the Coach. The team is retiring from the Calgary airwaves and Don’s tenure on our board will come to an end. And 2017 will mark The Final Don, Joanne and the Coach a Kid to Camp tournament. We anticipate a sell-out and one of the best years yet in fundraising. Thank you to Don Stevens, Joanne Johnson and Jamie Herbison (The Coach) for your dedication to our cause and our community. Enjoy retirement and the greens! View this story on our blog for more pictures. Jack Perraton was known as the ultimate volunteer, and among his many volunteer roles was his nine-year term as chair of the Kids Cancer Care Board of Directors. During Jack’s term, the foundation experienced tremendous growth, and the crowning achievement of those years was the purchase and planned renovation of Camp Kindle. When Jack passed away in February 2012, after his second battle with cancer, his good friend JR Shaw of Shaw Communications decided to do something special in his memory — something that would honour Jack and the life he lived. Jack had passed away before the renovation of Camp Kindle could be completed, and JR felt that completing it in his name would be a lasting tribute to Jack’s spirit and generosity. Along with Jack’s footprints will be those of countless volunteers to come — volunteers who will also leave a lasting impression in the lives of children with cancer. With a charitable contribution to our 2017 volunteer program, Shaw Communications is helping keep the volunteer legacy alive by providing the necessary resources to attract and maintain the best volunteers at Kids Cancer Care. Eleven-year-old Levi is one of many kids to experience the lasting influence of volunteers in his life. Diagnosed with high-risk leukemia at 18 months, Levi endured repeated rounds of chemotherapy that lasted until he was five years old. Although Levi is cancer-free today, survival came at a cost. He suffers from high levels of anxiety and neurocognitive issues that are affecting his ability to learn and function at optimal levels. Levi’s psychologist believes he suffers from post-traumatic stress disorder due to the invasive medical procedures he received as an infant. For years, staying overnight at Camp Kindle was out of the question for Levi. The thought of being away from home for a whole week was just too stressful. Each time he tried, his anxiety got the best of him and he came home from camp mid-week. With energetic coaxing from his parents, Levi decided to give Camp Kindle another try. After a couple of rough patches on Monday and Tuesday, and repeated telephone conversations with his mother, Levi reluctantly agreed to stay on until Wednesday. Meanwhile, his mother Cheryl and Levi’s counsellors met by telephone each night to explore ways to help him manage his anxiety. When Cheryl spoke with Levi on Wednesday evening, she couldn’t believe the transformation in her son. “I could hear joy and confidence in his voice. He was proud of himself!” she says. Finding the perfect complement of volunteers at Camp Kindle is essential to a child’s camp experience, and the nature of the role requires rigorous screening and intense training. Thanks to companies like Shaw Communications, kids with cancer will continue to feel the lasting impact of volunteers at camp and at every stage in the cancer journey. Volunteers are active on all fronts of the foundation, from volunteer cooks who prepare home-cooked meals for newly diagnosed families, to one-to-one camper aides who provide extra support at camp, and specialized tutors who support children struggling at school. Shaw’s gift to the volunteer program will leave a legacy of giving in the hearts of children with cancer. A proudly Canadian company, Shaw is committed to improving the lives of Canadian kids and youth through the Shaw Kids Investment Program (SKIP). To learn more about SKIP, visit Shaw.ca/SKIP. To see this story and a complete photo gallery of our hard-working volunteers in action, visit our blog. The relationship began in 2009 when Ted Poppitt, former Senior Vice President of Client Service at MNP, brought the company on as presenting sponsor of the gala. Since that time, the relationship has grown and MNP has become increasingly involved with the foundation, participating in the Ride for a Lifetime and the Don, Joanne and the Coach Golf a Kid to Camp tournament. Bobby Orr, Wayne Gretzky, Gordie Howe, Haley Wickenheiser, Jarome Iginla. Idolized by fans, their stats are etched in the minds of those who love the game and their names are stitched across the backs of well-loved jerseys by those who cheer their names. At Kids Cancer Care, we know of a special kind of hero from the good ol’ hockey game – one that makes an impact on AND off the ice. These hockey heroes aren’t just players, they are coaches, hockey moms and dads, friends, schoolmates, principals, administrative staff. And they are changing the course of childhood cancer. Our community hockey partners are exceptional. They raise funds for Camp Kindle, for research, for outreach programs, for hospital programs, scholarships and PlayStations (we’ll get to that). But, we figure the best way to tell you about these hockey legends is to run down the stats for you. - Teammates shoveled sidewalks, collected bottles, reached out to friends and family to raise money for Kids Cancer Care. - Many of the players shaved their heads on CTV Morning Live, extending a brave show of support for the children who lose their hair to chemotherapy. - Raised over $44,000—enough to send 29 children affected by cancer to Camp Kindle. The Hockey Heroes fundraiser in honour of team member Tyler Oakenfold’s best friend Joel Zukowski. Joel passed away in October 2015 at the age of 16 after a courageous seven-year battle with brain cancer. He was a quiet, gentle soul who touched countless lives through his kindness and wisdom. Joel and Tyler first met in pre-school at the age of four. The boys shared a love of hockey, playing shinny on the homemade rink in Tyler’s backyard. The 20 players on Tyler’s hockey team, the Northwest Calgary Athletic Association Midget AAA Flames, vowed to raise $30,000 to send kids affected by cancer to Kids Cancer Care’s Camp Kindle, where Joel had spent much time. They raised $14,000 more than their goal and they are back at it again in 2017. This year, they are hoping to expand the amount of teams and players involved. It all started with the love of the game and a dear friend. - Alec was a member of the team and the fundraiser was started to show support for his family. Today, the hockey fundraiser continues in his memory. - Passionate about hockey and video games, Alec inspired fundraising for new PlayStations for unit one at the hospital, as a distraction for kids during treatment. Thanks to Alec, kids can continue to play their favourite sports virtually, while they are in the hospital. Only days after celebrating his 13th birthday, Alec Remenda was diagnosed with Ewing sarcoma, a rare type of cancer in which rapidly growing tumours are found in the bone or in soft tissue. Alec was known for his love of hockey and he was passionate about playing for the Simon Valley Hockey Association. While his treatment made it so he couldn’t play, he remained an important part of his team. That’s why they started the Stick It to Cancer charity hockey tournament. Sadly, after years of extensive chemotherapy and radiation treatment, Alec passed away in July of 2016. His team has vowed to continue fundraising in his honour. This year will be the third annual event. - Our name appears on volunteer jerseys, the ice and in the program. A great way to raise awareness about Kids Cancer Care, the tournament draws as many as 100,000 spectators over seven days! - Kids Cancer Care volunteers and teen leaders sell 50/50 tickets with the proceeds coming back to our programs. The Mac's Midget AAA World Invitational Tournament is a prestigious ice hockey tournament held annually from December 26 to January 1. The tournament features 25 male and 15 female teams from across North America and Europe. It draws large crowds and raises a ton of money for our Teen Leadership Program, where patients, survivors, siblings and bereaved siblings enjoy opportunities to develop as leaders through self-reflection, peer support, skill building, volunteerism and a service trip. - They have given over $1.2 million dollars to Kids Cancer Care, including a sizeable donation to help us realise our dream of owning and operating our own camp. - Number 11, Mikael Backlund, is our Flames champion. He picked us as his charity of choice, and invites our families to a game each year and supports us year round. Through annual fundraising events such as the Flames poker and golf tournaments and the Flames 50-50 raffles we thank our supporters. Through annual fundraising events such as the Flames poker and golf tournaments and the Flames 50-50 raffles we thank our supporters.The Calgary Hitmen and Calgary Flames are ideal partners. Not only have they been a part of creating memorable experiences for kids affected by cancer by supporting our programs and camps financially, but they also provide tickets to games, along with meet and greets with the players. These games are a light in an otherwise dark cancer journey. In 2009, after 20 years of having to beg, borrow and rent space to send children with cancer to camp, Kids Cancer Care purchased its own camp. We called it Camp Kindle because, for hundreds of Alberta children and families facing cancer, it would be a place where childhoods, interrupted by cancer, could be rekindled. We needed funds to purchase the camp and carry out the necessary upgrades and renovations to make it suitable for children with cancer. The Flames Foundation for Life was there for us when we needed their support the most. With a donation of $1,000,000 they helped us fulfill our dream. In July 2012, after undergoing more than $12 million in renovations, Camp Kindle re-opened to Alberta children affected by cancer and their families. From midgets to the pros, Kids Cancer Care is honoured to have such great support from our hockey community in Alberta. And now, supporting us is even easier. We recently launched online Community Fudnraising pages to make your fundraising campaigns even easier. To learn more, click here. Thank you to all our hockey partners for their dedication to changing the course of childhood cancer. When you think of tundra, you typically think: “Vast rocky terrain in the frozen hinterlands—cold winds and permafrost.” But there’s another kind of Tundra in North America that’s a whole lot warmer, a lot more fun and definitely a lot more charitable. Tundra Process Solutions Ltd. joined Kids Cancer Care in 2010 as a community fundraising partner and has given with gusto ever since. Specializing in industrial equipment solutions for companies across western Canada, Tundra manages to build fun and friendship into everything they do. Their work-hard, play-hard attitude has seen the company grow 50 per cent every year for the past decade. They are the seventh fastest growing company in Canada today. Fortunately for Kids Cancer Care, successful fundraising seems to come as naturally to Tundra as hard work and serious play. Since then, Tundra has become a major fundraising force for children with cancer. They annually host ugly sweater days, curling bonspiels, indoor rock climbing events and Stampede ho-downs. With matching gifts from the company, Tundra’s 200-strong team has raised $100,000 for Kids Cancer Care. Tundra has also donated significant amounts of time and equipment to a large heating project at Camp Kindle. Valued at $25,000, the new heating and ventilation systems will ensure our campers stay warm at night and provide a safe and warm indoor space where they can play all year long. Their philanthropic spirit has not gone unnoticed. Giving at least one per cent of their profits to charity, Tundra is an official Imagine Caring Company. Tundra even manages to help Kids Cancer Care, while building up Tundra employees. They rented Camp Kindle for their 2015 staff teambuilding retreat, where any profit generated from the rental goes toward our cancer camp programs. Iggy took part in the 2015 High Hopes Challenge, raising over $20,700 doubling his $10,000 fundraising goal, before he and the other challengers headed for Camp Kindle to master the challenge course with their kid coaches. Iggy is also an active member of the Kids Cancer Care Board of Directors, where he is the volunteer chair of our fundraising committee. As a member of the board, Iggy and the other board members are responsible for the financial oversight and strategic direction of the foundation. Indeed, even children of Tundra staff are getting involved. In 2014, eight-year-old Kaydence asked her friends to donate money to Kids Cancer Care in lieu of birthday gifts. The daughter of Casi Simcoe, an accountant at Tundra, little Kaydence raised $110 to help kids with cancer. And, of course, Tundra matched every dollar she raised. This post also appears on our blog, with more photos. When Tony Dilawri was invited to be one of 12 corporate challengers in Kids Cancer Care’s High Hopes Challenge, his first question was, “What’s the most you’ve ever raised?” Then he promised to double it. You could say Tony Dilawri has a knack for doubling, redoubling and generally increasing results. When Dilawri Group of Companies first signed on as the presenting sponsor of the Dad and Daughter Gala in 2011, the event was raising $114,000. Five years later, the gala is now raising $450,000. But the Dad and Daughter Gala isn’t only a financial success. It’s one of Calgary’s hottest events, selling out in less than a minute every year. Tony is the same in business. Following in the footsteps of his father, who owned a small GM dealership in Ottawa, Tony and his brothers Ajay and Kap opened their first dealership in 1985. Since that time, Dilawri Group of Companies has grown into Canada's largest automotive group with 58 franchised dealerships, representing 31 automotive brands, throughout central and western Canada. Watching their father, the Dilawri brothers learned, first and foremost, that business comes down to people. Do right by your customers and employees and your business will naturally flourish. The Dilawri brothers bring a similar attitude to their philanthropic endeavours. Established in 2002, The Dilawri Foundation has given tens of millions of dollars to charitable causes across Canada. Kids Cancer Care is one of many charities they support. In addition to the Dad and Daughter Gala, Dilawri Group of Companies is a long-time sponsor of the Don, Joanne and the Coach Golf a Kid to Camp tournament. And this year, Tony raised funds as a challenger in the 2016 High Hopes Challenge. Tony’s commitment to Kids Cancer Care comes down to the kids. Afterwards, Tony approached Danielle and said, “I want to make your life easier. What can I do to help?” Danielle turned down support for herself but asked Tony to invest in other children affected by cancer. Tony has been investing in Kids Cancer Care ever since. At 26, Danielle Rettie still battles the same disability she talked about in her speech at the gala. Diagnosed with cancer in her spine as an infant, Danielle underwent two spinal surgeries, leaving her left leg much weaker and smaller than her right. As a result, she has an uneven gait, which causes her to fall a lot. Danielle endured countless surgeries, painful medical procedures and years of physiotherapy. She began each school year in either a cast or a brace. Even today, Danielle suffers from excruciating back pain if she doesn’t keep up with her physio-exercises. But, as Tony noted, Danielle does not feel sorry for herself. Danielle credits her strength and attitude to cancer camp. Her camp experiences helped her to build her confidence and foster an emotional tenacity that sustains her to this day. Helping young people like Danielle, Dilawri Group of Companies does much more than help the children directly affected by cancer. By building kids up, they set kids up to pay it forward, creating a ripple effect well into the future. An avid snowboarder now living in Nelson, BC, Danielle cycles everywhere and even cycled in Tour for Kids Alberta, a three-day cycling event that raises money for Kids Cancer Care. Working toward a career in occupational therapy, Danielle looks forward to bringing her can-do attitude to patients with disabilities, so they can also live rich, full lives. Thank you Tony and Dilawri Group of Companies for investing in kids like Danielle. By investing in kids today, you’re investing in a better world for tomorrow. If you work in the oil and gas industry, chances are you’ve crossed paths with the dynamic, customer-focused team at Enerflex Ltd.
What was once a small Calgary shop with a handful of employees 35 years ago is now an international oil and gas service company operating in 17 countries worldwide with 3,200 employees. There’s no doubt. Enerflex is in for the long haul. As Kids Cancer Care’s longest standing community fundraising partner, Enerflex has also demonstrated remarkable staying power for children with cancer. And build a legacy they have. In 1997, when the two organizations first met, Kids Cancer Care was just developing its first SunRise camp program for children ages three to six. The Enerflex donation that year made SunRise possible. Since then, the annual Enerflex Charity Golf Tournament has raised over $1.2 million for Kids Cancer Care’s camp programs and made summer camp possible for thousands of kids. Once again, Brad credits the success to Enerflex employees: “We never have a shortage of employees and volunteers when it comes to Kids Cancer Care,” he says. The Enerflex commitment to Kids Cancer Care goes beyond the annual charity golf tournament. Enerflex employees regularly scoop ice cream for kids at Camp Kindle and, last June, 50 employees participated in a Kindle Care Day at camp—lugging boulders, hauling dirt and gravel, painting and landscaping. The powerful words from a grieving mom echoed through the school gym. On a normal school day, this gym would be full of the sounds of junior high students; chatting, yelling, with the sound of a basketball bouncing, maybe sneakers pounding on the wood floor. This was no normal school day. This was Edyn's day. Despite being full of kids, the gym was calm, even peaceful, as Kristyn Drever spoke. On Friday, April 17, 2015 Bishop Pinkham Junior High School students and teachers came together in an act of courage and generosity, when 117 of them participated in a shave fundraising event to honour Edyn Drever, a 12-year-old student who passed away from brain cancer in September 2014. Far surpassing their $20,000 fundraising goal, the students and teachers of Bishop Pinkham have raised more than $90,000, placing them among the top three Shave Your Lid for a Kid® events. After weeks of sudden and unexplained headaches and nausea, Edyn was diagnosed with glioblastoma multiforme (GBM), an aggressive brain cancer that is rarely found in children. Although she endured a nine-hour brain surgery, followed by months of radiation and chemotherapy, the cancer persisted and Edyn passed away at the age of 12. Inspired by the kind, fun-loving girl, who was wise beyond her years, the students in Edyn’s homeroom class decided to do something meaningful in her name—help children with cancer by shaving their heads and raising funds and awareness for Kids Cancer Care.